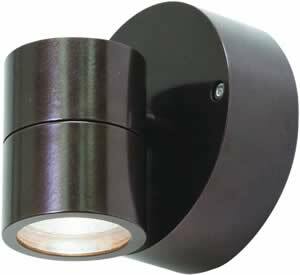 Diameter 2" x Length 5" Width 3"
Extension Adjustable 5" to 14"
Provides focused illumination for outdoor use in residential and light commercial applications. Ideal for walkways, patios and play areas creating an inviting exterior space as well as providing safety and security. 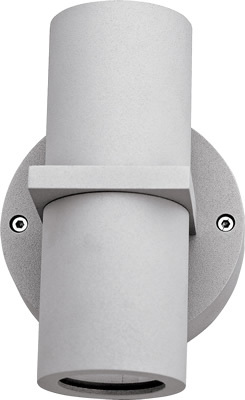 Eave or wall-mount only. 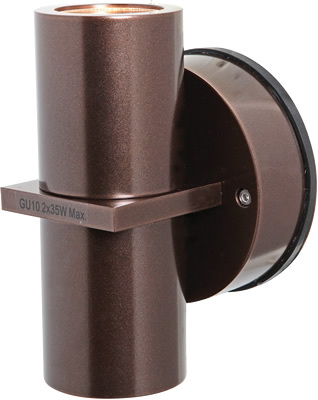 Rugged, weather and rust resistant die-cast aluminum canopy and socket holders (gaskets included) in bronze or white finish. Tool-free adjustable heads for up/down and side-to-side aiming. 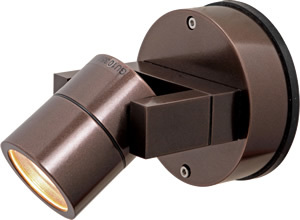 Twin holders allow for light to be focused in two directions and are perfect for mounting on the corner of structures. Designed for easy mounting to junction box. CUL listed to US and Canadian safety standards and suitable for wet locations. Guaranteed for one year against mechanical defects in manufacture. 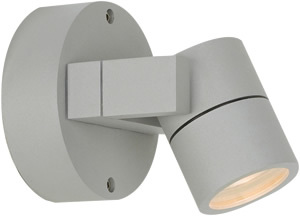 Extension Adjustable 6" to 14"
Provides focused illumination for outdoor use in residential and light commercial applications. 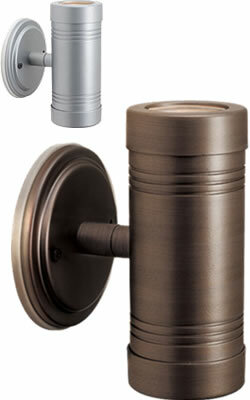 Ideal for walkways, patios, and play areas creating an inviting exterior space as well as providing safety and security. Eave or wall-mount only. 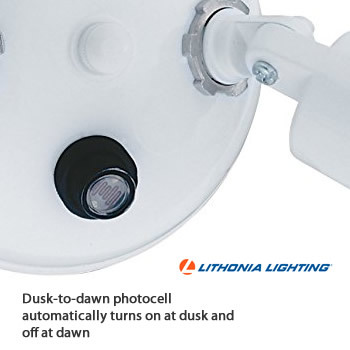 Dusk-to-dawn photocell automatically turns on at dusk and off at dawn for convenience and energy savings. 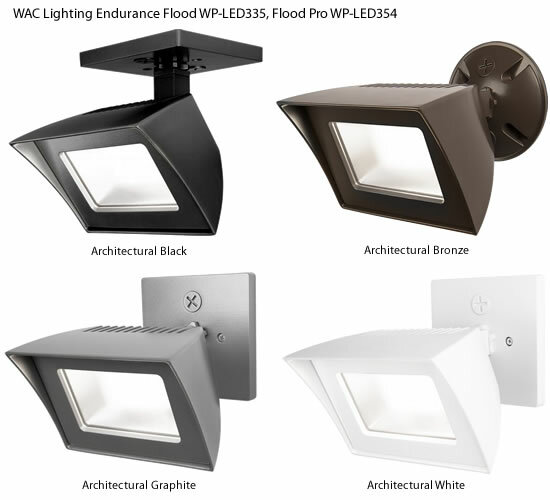 Rugged, weather and rust resistant die-cast aluminum canopy and socket holders (gasket included) in bronze or white finish. 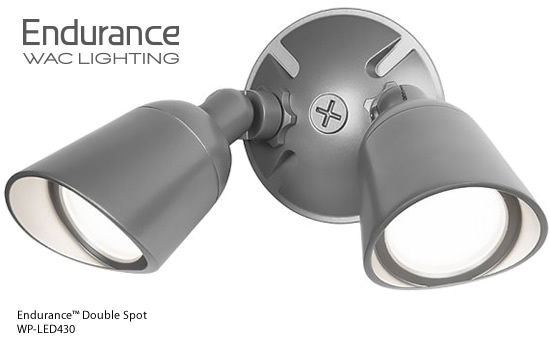 Tool-free adjustable heads for up/down and side-to-side aiming which allows for light to be focused in two directions and is perfect for mounting on the corner of structures. Designed for easy mounting to junction box. Consumes 25 input watts utilizing 120V 60Hz driver. 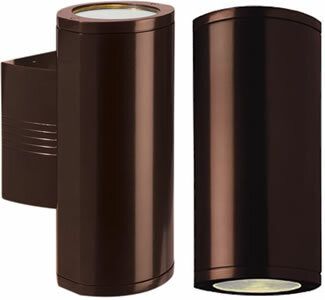 Available in models with and without dusk-todawn photocell. 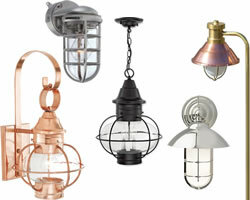 Rated for outdoor installations, -40°C minimum ambient. 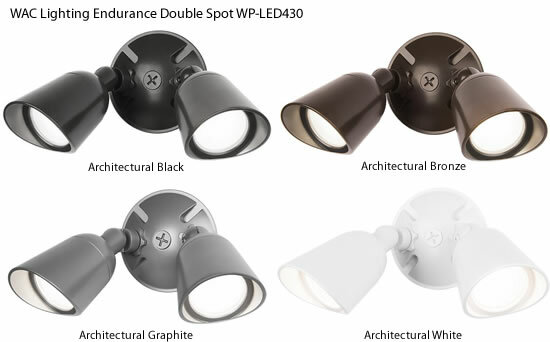 25 watt LED wall or ceiling mount security floodlight delivers 2,160 lumens for an energy-ecient replacement of (2) 90W incandescent security lights. 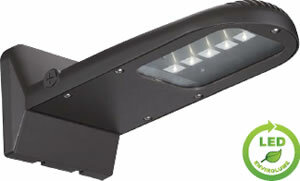 The OLF LED provides years of maintenancefree general illumination for outdoor applications. 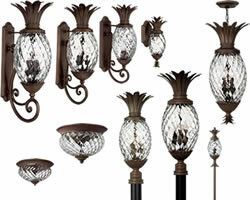 Ideal for entrances, walkways, cooridors, yards, driveways and patios. 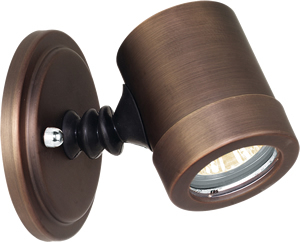 Width 7" x Height 4.5" x Depth 6.25"
Rugged cast-aluminum, corrosion-resistant housing with dark bronze or white polyester powder paint for lasting durability. LED lamp heads are thermally isolated from the driver that is located in the rear housing, promoting a long service life. Lenses are sealed to keep out moisture, dirt and bugs. 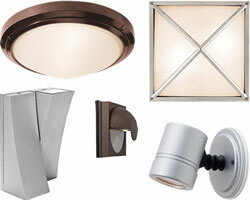 LEDs maintain 70% of light output at 50,000 hours of service life2. 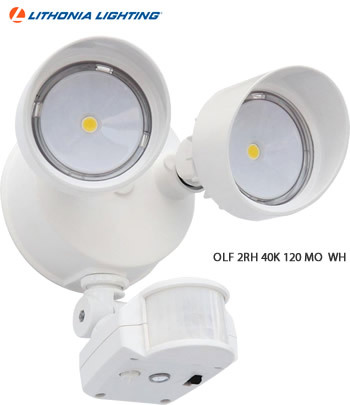 The OLF 2RH LED security floodlight featuring motion occupancy technology, combines powerful LED security lighting with motion response light-on-detection. 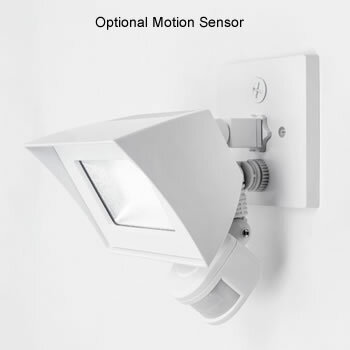 Features include 180 degree range/70ft forward detection, built-in photocell to prevent daylight operation, sensor sensitivity adjustment and a test/time switch to adjust duration lights stay illuminated. 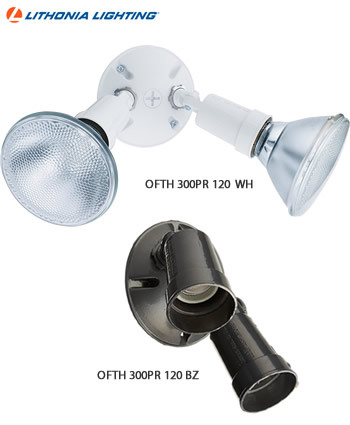 Delivering 2,160 lumens, at only 25 input watts, OLF 2RH replaces up to (2) 90W PAR incandescent lamps offering 86% energy savings. 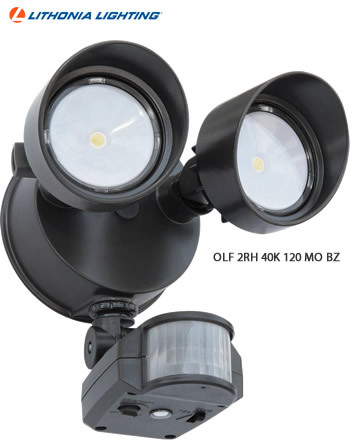 Motion Occupancy (MO) combined with enhanced design features and breadth of options make the OLF family the best choice for residential and commercial applications that require reliable security lighting. 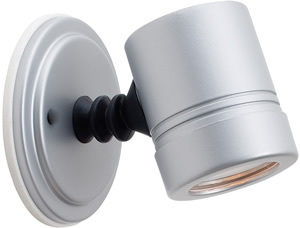 Mounts to a recessed junction box on wall or ceiling. Crossbar and hardware provided. Wet location listed for mounting 4 feet above ground. Tool-less adjustable heads allow for precise aiming. Neighbor-friendly visors are adjustable or removable. UL/cUL listed Listed to U.S. and Canadian safety standards for wet locations. 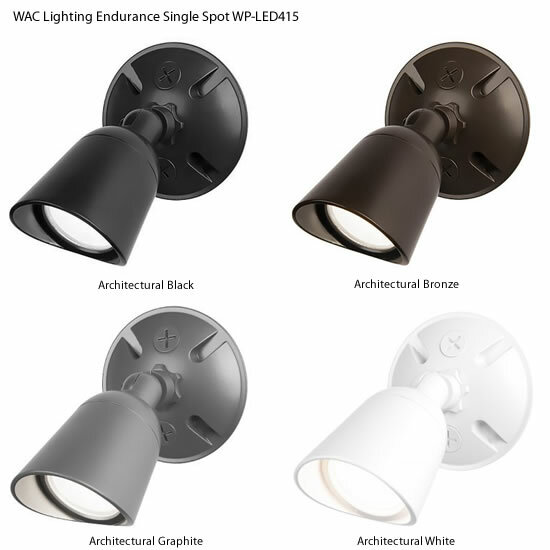 Tested in accordance with IESNA LM-79 and LM-80 standards. 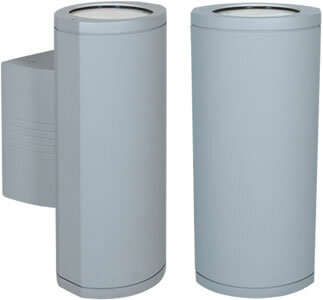 Increased mounting height reduces detection range. Time settings: TEST / 1 / 5 / 10 minutes. Detection zone: 180° forward detection. Photo control: Deactivates lights during daylight. Temperature compensation: Automatically calibrates sensitivity for varying ambient temperatures. 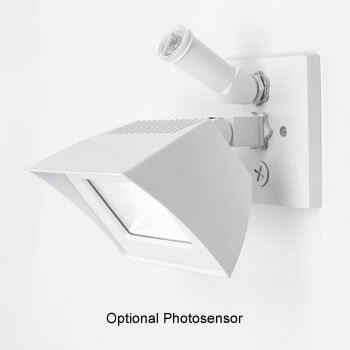 Manual override: Temporarily disables sensor at wall switch. Turns light on. Automatically deactivates at dawn. 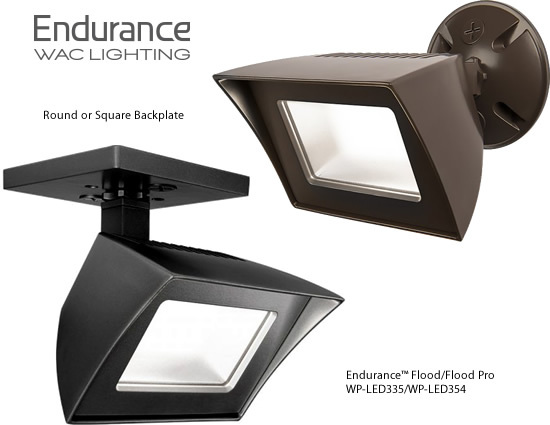 UL certified to US and Canadian safety standards for wet-location mounting higher than 4 feet off the ground. 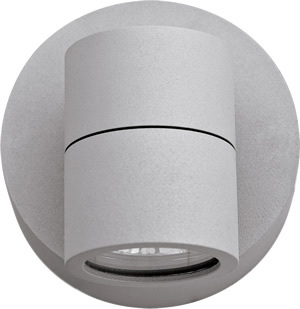 Dimensions: 6" x 7.8" x 4.5"
Motion sensor detects motion 110° up to 60 ft. 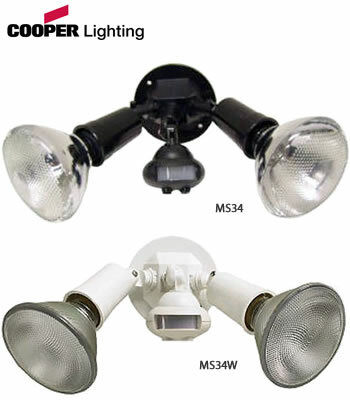 The All Pro Cooper Lighting MS34 Motion Activated Floodlight senses heat images from objects such as people, large animals and automobile engines. 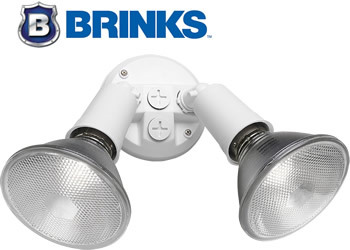 When motion is detected, the lights will automatically turn on. Once motion has stopped, the lights will turn off after a preselected time delay. 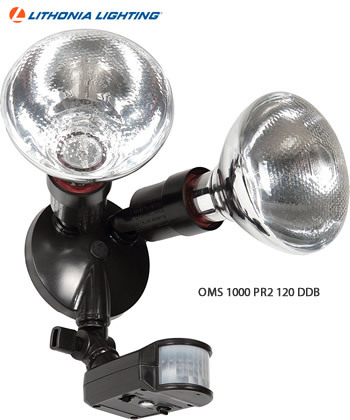 The motion activated floodlight may also be used as a standard floodlight. 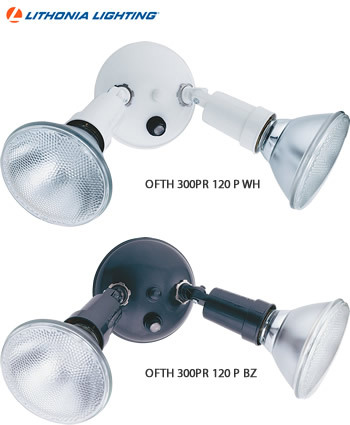 This fixture was designed to work with up to 150 watt maximum PAR halogen flood bulbs. 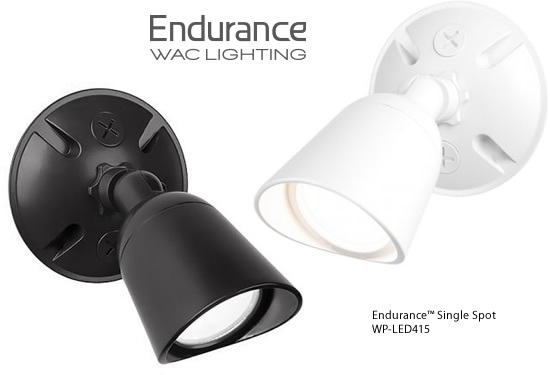 For improved energy efficiency, lower wattage PAR halogen flood bulbs may be used. Compact Fluorescent (CFL) bulbs contain electronics which may interfere with the motion sensing function of your fixture and are not recommended.